Yes, that was an earthquake you just felt here in New York and Washington, DC. 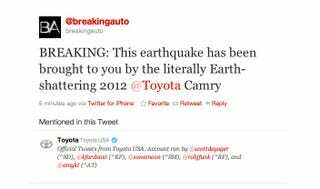 We're told it was a 6.0 earthquake located with an epicenter around Richmond, VA. Could it have been brought to you by the new earth-shattering 2012 Toyota Camry? Probably not. For anyone who's truly worried about this little itty-bitty quake, here in New York there's no road disruptions yet reported, and no subway disruptions yet reported in New York City, according to the MTA. Metro-North & LIRR are OK, too.